Today, I’m just going to highlight the potential of some price action. It’s not often that I offer up a trade as the sole topic of a post. No talk of corrections. No sovereign debts. No interest rates. No belly-aching about complacency. Just gonna put up some plain old charts showing some price behavior that could be used for profit. Way back, as in a year ago, I provided an opportunity to short Toyota. It was a nice, profitable little trade that paid off immediately. For such a steady behemoth of the automotive world, Toyota tends to consistently present tradable short-term set-ups despite any prevailing macro-outlook at the time. The pattern set-up is simply an exercise in gap-filling since the end of January. That’s it. No long-term backtesting of the pattern, which means that I’m not calculating probable odds with any statistical significance what so ever. In fact, it’s simply a read of the tape with a tight stop. Have a look at the chart. 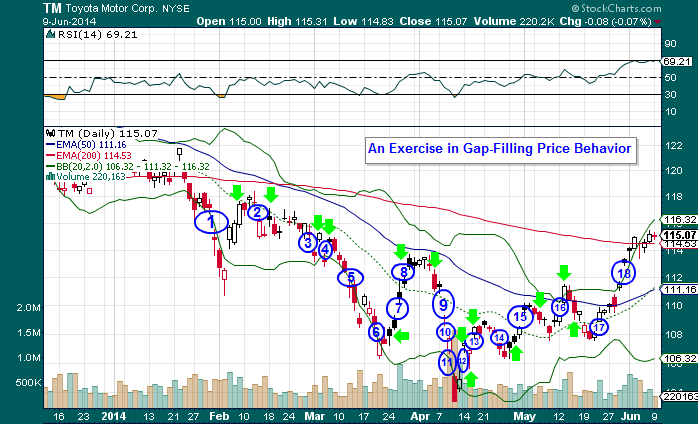 You’ll observe that since January 31st, TM has “gapped & filled” fairly quickly on 16 occasions(gaps at blue circled numbers – fills at green arrows). I may have left out a green arrow or two but the chart is convoluted enough. You get the point. A fill on gap numbers 17 and 18 is what we’re playing. Shorting here at $115 with an expectation of a cover at $108. I leave it to the traders out there to calculate your own risk/reward numbers. We have a price behavior that has proven to occur 100% of the time, at least since the last day of January. Keep a stop of 10% to be relatively safe, which would essentially stop you out of the trade if it goes against the prediction and breaks out past the key number of $125. You may be thinking that shorting here for a $7 move downward may not be worth the risk. A 10% chance of loss for a potential gain of only 6%? What gives? You can tighten the stop if you absolutely have to skew the risk/reward ratio in your favor. Let’s say the trade hits the objectives in 60 days. That 6% return on the short annualizes out to a 42% return. I think any professional trader will take 42% annual returns any day of the week. There is of course the leverage of options, which is how I’ll personally play the set-up. I’ll leave you to your own personal devices when it comes to option strategies. Sorry. I ain’t Greg Harmon over here, throwing out Calendars, Spreads, Strangles, and Butterflies. For those that play the option game, do your thing. For those that don’t, stick with a simple short of the shares or perhaps buy a basic Put with an October strike, although beware the lack of a hedge on a straight Put purchase. It is possible to go short in these markets. Dangerous, but still possible. Recall that I went short on coffee a couple of posts ago, on May 16th. 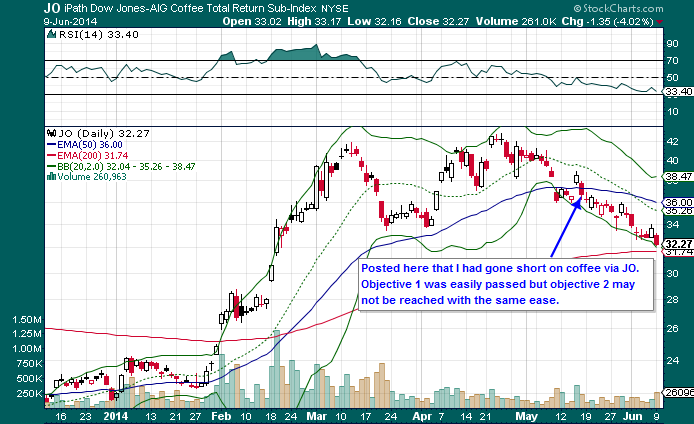 Of course coffee is a commodity, but I used the ETF proxy. And for you Fibonacci retracement addicts, using the weekly low off the first week of November, then 31.8% is $34 and change while $30 is tightly in between the 50% and 61.8% retracement levels. I felt safe in using $30 as a round number objective, especially in light of the high open interest at the expiration month for the primary asset in my own play. Coffee may retrace all the early 2014 gains in a full construction of an Eiffel Tower. 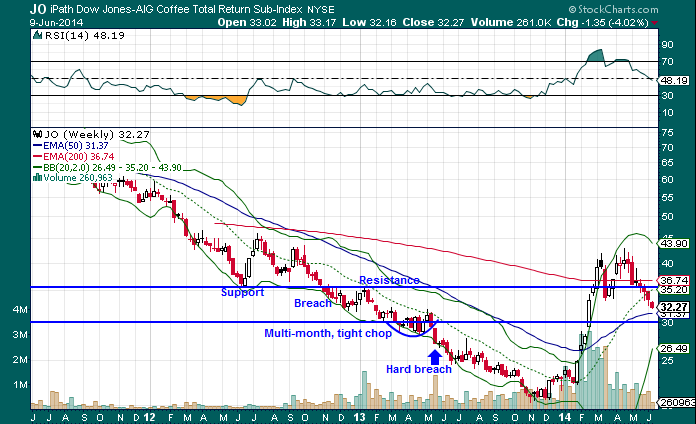 If you’re in the coffee short then adhere to your risk parameters and enjoy the profit. Getting back to Toyota, trading in a low volatility environment can be dangerous. I think there’s enough volatility in Toyota’s tape to warrant the short. As with a lot of trades, you risk a little to fill your pockets with some change. This trade is one of those singles that people forget to swing for after striking out for the umpteenth time on a grand slam attempt. Please visit my disclaimer before leaving and taking any action. Good luck out there.